Apple has always touted the security of OS X as one of its strongest points. Security features such as required authentication, the login.keychain, and Filevault, when turned on, are seamlessly integrated into the operating system. It is because of this I find it hard to believe that Apple has used a very weak encryption method, at least OS 10.2, to obfuscate a user’s password. Now, this method of encrypting the automatic log in user’s password has been around for quite some time. The earliest mention I can find of Automatic Login is in a presentation by Leon Towns-von Stauber in 2003[i] (OS 10.2 & 10.3) and in the Apple mailing lists[ii] from 2004. The encryption method, XOR, is used to conceal the user’s login password when Automatic Login in turned on for a user account. 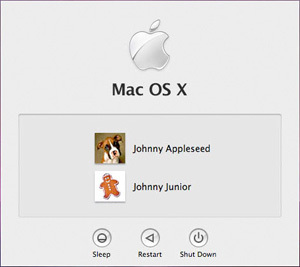 OS X allows a user to select one of three ways to login to their account. 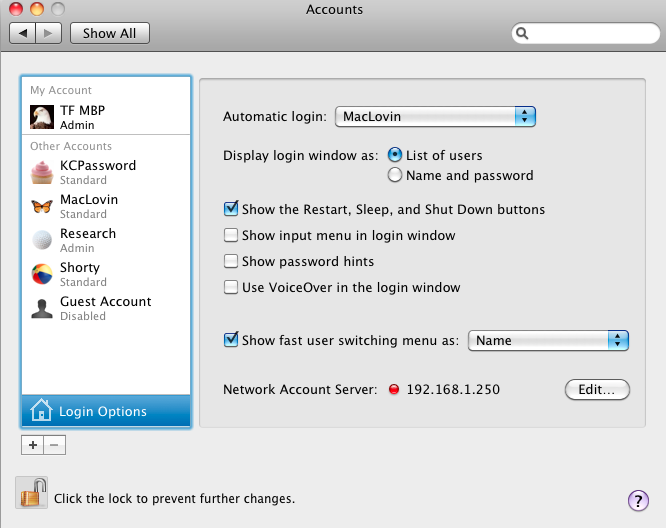 Login options can be set in the Accounts preference in the System Preferences application. There are three different methods that we can use to log in on a Mac: List of users, Name and password, and Automatic Login. Probably the most widely used method of logging onto a Mac when there is more than one user is the “List of users”. The list of users shows the name of the users and their icon, which is selected upon creation of the user account. In order to login to the account, one only needs to click on the icon and then the password window will open which enables the user to type in the password and gain entry to their account. A more secure option is the “Name and password” login. This method provides only a login window that has an area to type in a username and the password. There is no other information such as a list of users that can be used for social engineering in order to gain access to a user’s account. 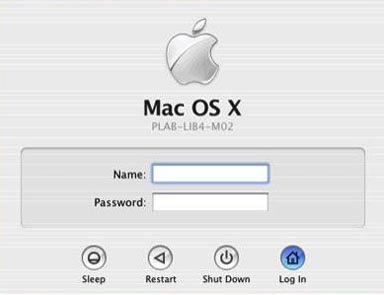 By default with a new Mac or a fresh installation of Mac OS X, the automatic login is turned on. Automatic Login bypasses the need to login and allows the computer to boot straight into the users Home account. There is no requirement to authenticate or other security function associated with the automatic logging for access to the Home folder. As mentioned on Inside the Core, the episode on hardening your Mac, it’s wise to turn off automatic login because of the potential for full access to your user account if the laptop is stolen or lost. So what happens when automatic login is turned on? When the user is selected, an authentication window is opened and the password for the user must be inputted. 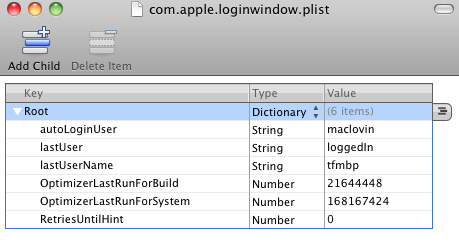 Once the authentication is successful, the /private/Library/Preferences/com.apple.loginwindow.plist is amended to show the automatic login user. Once the plist has been updated, a file, kcpassword, is created in the /etc folder. The kcpassword file holds the login password for that automatic login user only. 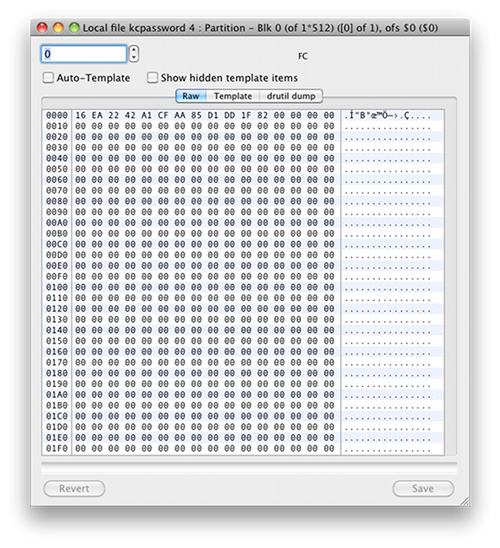 Just looking at the file will not reveal much other than a string of hex characters. The user password is encrypted using XOR, or exclusive or. XOR is an encryption algorithm that combines two binary strings to create a 3rd encrypted string. The encryption method is very weak and decoding it, once the key string is known, is simple. Gavin Brock decoded the kcpassword file and stated in his blog [iii] that the file uses an 11 byte pattern that repeats depending on the length of the password. The password itself uses a 12 byte string. This means that if the password is 11 or less characters, there will only be 12 bytes shown in the kcpassword. If the password were 12 characters in length, then there would be 24 bytes used and if it were 25 characters long, the kcpassword would show 36 bytes used. As we look from left to right, we see that the 6th byte of each string is the same. This represents the null and the end of the password. This means that the password is 5 characters in length. The remaining hex values to the right of the null appear to be of no value to us. How do we decrypt the password using the key string? As an example, lets say that the first byte in a password is 0×0D. 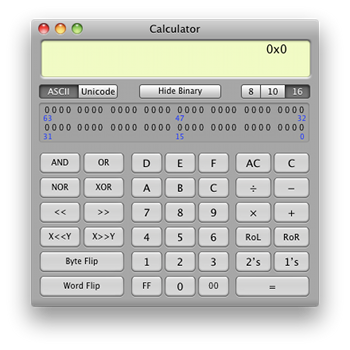 0×7D is the first byte in the key string for the XOR operation that is used to decrypt the kcpassword. If we break both down to their binary equivalents we can easily break the encryption for the first byte. When we convert 01110000 to hex we get 0×70, further converting it to ASCII gives us the first letter of the password, “p”. Here is an example of a longer password and how the XOR key string repeats itself. The password is 13 characters length so it uses 24 bytes in total. The ability to decode the kcpassword file may have a limited impact for us forensically. Auto-login enabled provides the ability to boot a restored drive or a VM and gain access to the user account and open the login.keychain. It would be of help if perhaps the image were not bootable such as with an unmountable file system, which if you have been doing Mac forensics for any time you have run into at least once. In this instance, attaining the login password for the user would allow for the opening of an extracted login.keychain, which may provide additional needed passwords to DMGs, secure notes, and wireless networks.The kcpassword will only reside in the /etc folder while Automatic Login is turned on. If the user who has Automatic Login is changed to another user, the prior kcpassword file is deleted and a new file with the XOR encrypted password is created. When Automatic Login is turned off, the file is deleted from the /etc folder. [i] Towns-von Stauber, Leon. OSX_Sec.pdf, LISA 2003, 136. [ii] Apple Mailing Lists, August 13, 2004. /etc/kcpassword. [iii] Brock, Gavin. Encoding & Decoding OS-X Auto-Login Password (/etc/kcpassword). Great to see Inside the Core is back! Useful information as usual, much appreciated.